ShredAway offers a turn-key shredding and recycling program designed for all businesses! 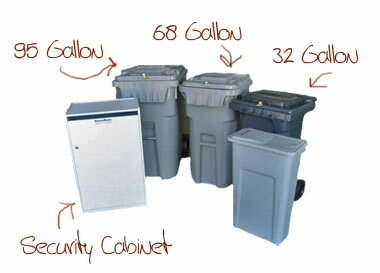 A lockable storage bin or console (see our container options) to securely hold your confidential information throughout the month. Our bins are designed to fit nicely in a corner or under a desk. On a scheduled basis, ShredAway's courteous staff will empty your bin, shred its contents on-site, and then recycle the shredded material. Our bonded staff will efficiently and quickly service your business. A certificate of destruction is provided with all servicing.